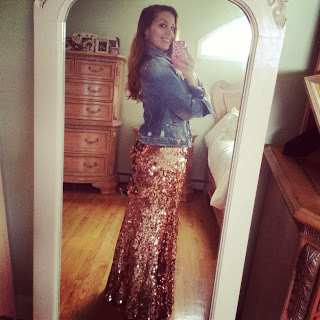 FoxyFashion: Glitz and Glam: When is it NOT okay to wear sequins? Glitz and Glam: When is it NOT okay to wear sequins? I live for sparkle. I am all for wearing sequins whenever. I wore this sequin maxi skirt out yesterday to go to Marshall's and got a few stares. The thing is, I didn't care. On the flip side, women were stopping me to comment about how great it was. I think there are no rules when it comes to fashion. Why save your clothes for a "special" occasion? Every day is a special occasion, so sparkle up! Love it! Glitter all day every day! awesome post.